Panther freshman Connor Nicholas seals the deal to ensure a quarterfinal appearance for the Panthers. What do you do after you defeat the #4 ranked team (Muncy) in the 2019 PIAA state wrestling championships? Well, you enjoy it briefly and then refocus because now you have to reload and get ready for today’s high noon showdown with the #5 ranked team (Burrell) in Pennsylvania. 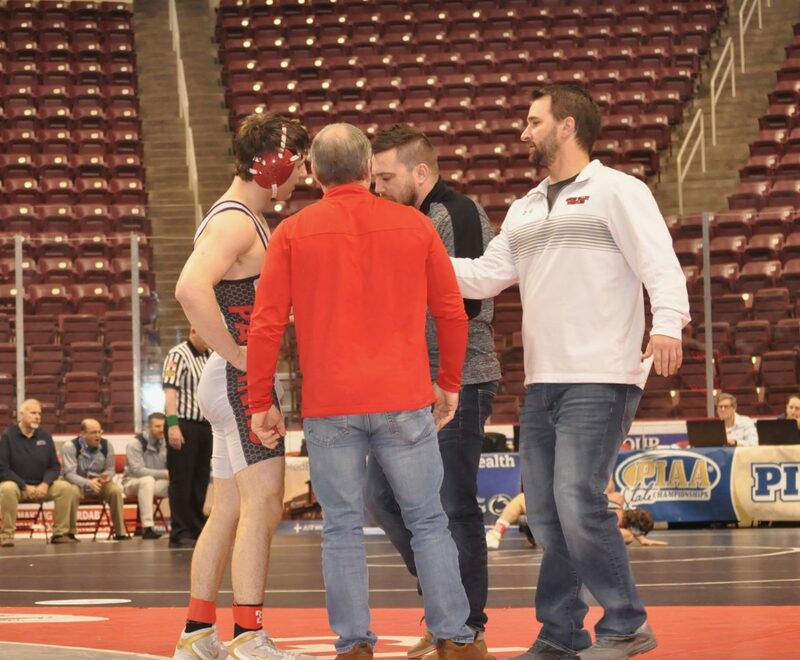 That is the odyssey that Coach Chad Shirk and his Saucon Valley wrestlers will have to endure as they continue toward a 2019 state wrestling title. 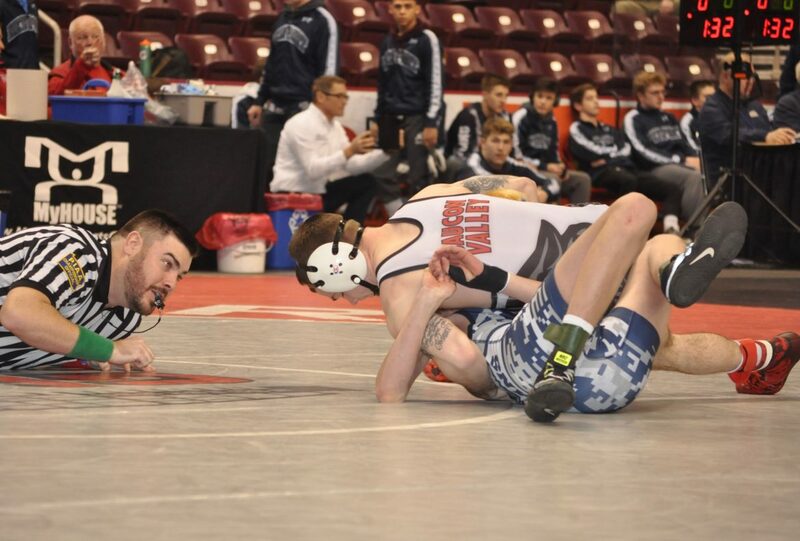 Against Muncy in the 1st Round of the 2019 PIAA wrestling championships, the Panthers won eight of the 14 weight classes. 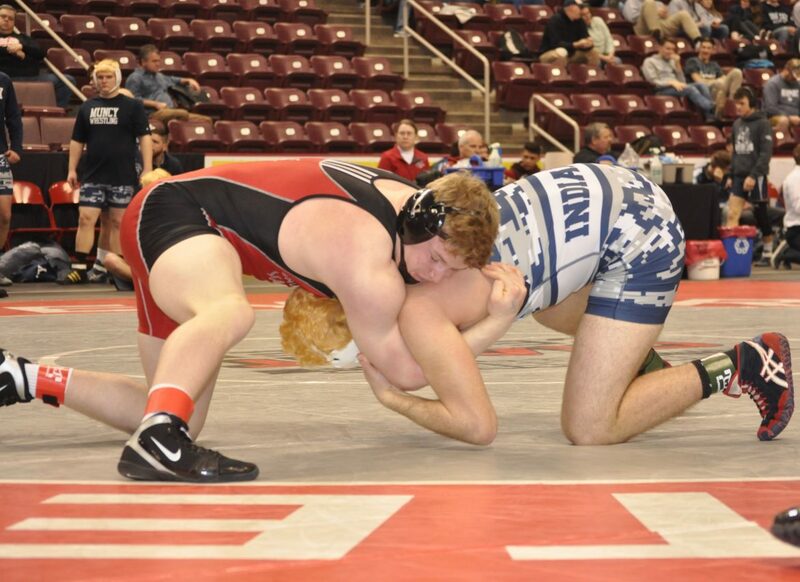 Saucon earned four pins, a tech-fall and three decisions. Saucon senior Josh Jones gets six in only eight seconds. 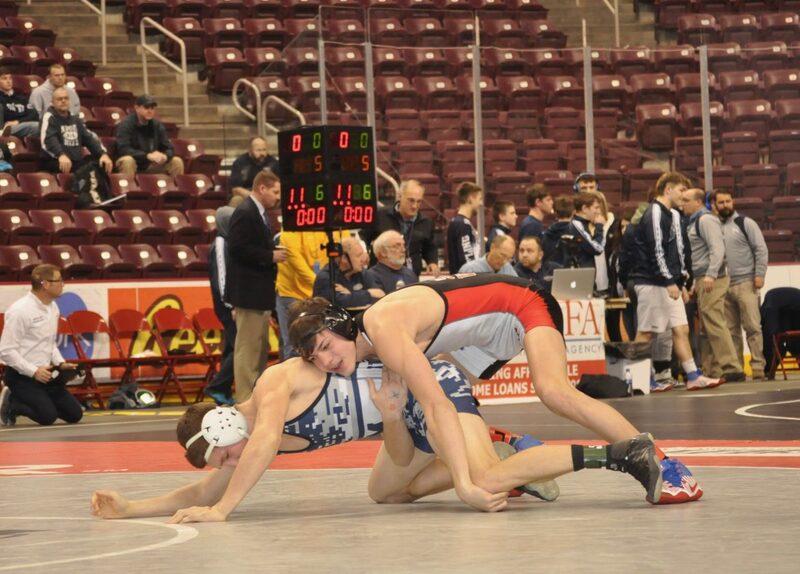 Connor Nicholas (106), Cael Markle (113), Josh Jones (132) and Nick Warnke (285) all recorded Saucon falls. With the match starting at the 126 pound weight class, the Panthers were clinging to a 20-19 team score when Nick Warnke (285) got the pinning parade started. Warnke’s first period pin built a 26-19 cushion for the Panthers. Then, Connor Nicholas (106) followed Warnke’s lead with his first period pin to extend the Panthers’ lead to 32-19. Cael Markle (113) crashed the pinning party with his :25 second fall to make it 38-19. Nicholas and Markle are freshmen. Nicholas’ victory clinched the win and would pave the way to today’s 12 o’clock quarterfinal against the Burrell Buccaneers. Saucon Valley’s Thomas Spirk picks up back points against the Muncy Indians. Saucon Valley’s Thomas Spirk decided to take a break from the pinning parade and admired the tech-fall scenery against Muncy. Spirk gave up the opening takedown, but roared back with a reversal and a series of turns to construct a 9-2 first period advantage. Spirk kept the pressure on with more back points and a reversal to build a 17-4 lead at the end of the second period. Starting the third period on bottom, Spirk hit his third reversal of the afternoon to secure a 19-4 tech-fall. Braydyn Lugardo tough on top as he fights for his win. 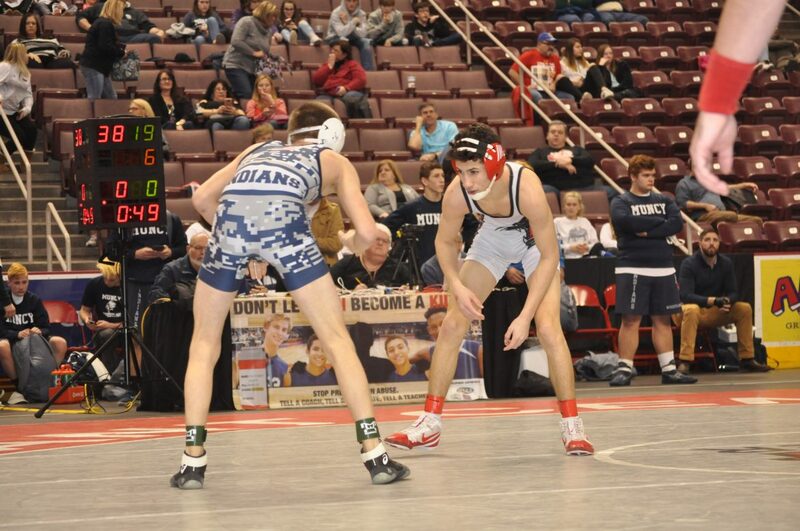 Nick Rosengrant (145), Matt Arciuolo (170) and Braydyn Lugardo (182) all chipped in decisions for the Panthers. 106- Connor Nicholas Fr., SV, pinned Alex Maiorana Fr., 1:34. 113- Cael Markle Fr., SV, pinned Chase Crawley Fr. :25. 120- Grady Oden Sr., Muncy, decision Kevin Dyer Jr., 8-7. 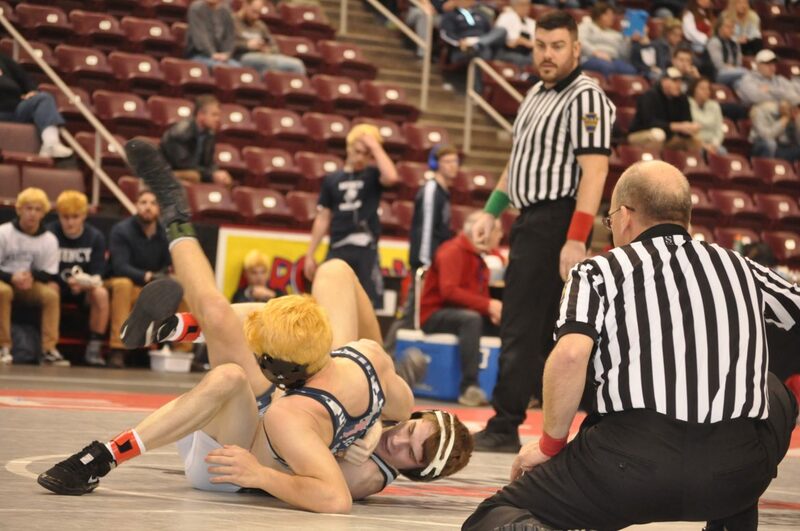 126- Bryce Vollman So., Muncy, pinned Ryan Gilbert Fr., :33. 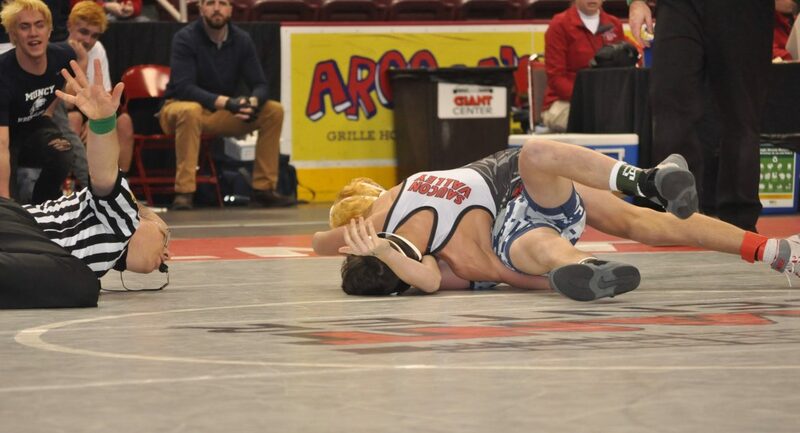 132- Josh Jones Sr., SV, pinned Jacob Hill Jr., :08. 138- Thomas Spirk Jr., SV, tech-fall Mario Barberio Jr. 19-4 (4:20). 145- Nick Rosengrant Sr., SV, decision Christian Good Jr., 7-2. 152- Coleman Good Sr., Muncy, maj-dec Ty Csencsits Fr., 17-5. 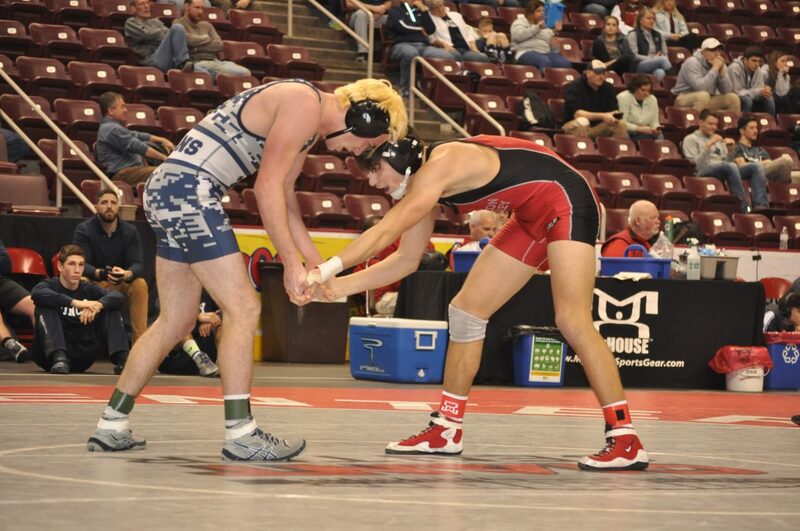 160- Gavin Eisenhower Sr., Muncy, decision Dante Mahaffey Fr., 8-7. 170- Matt Arciuolo Jr., SV, decision Ty Nixon Fr., 9-4. 182- Braydyn Lugardo Jr., SV, decision Ethan Gush So., 5-3. 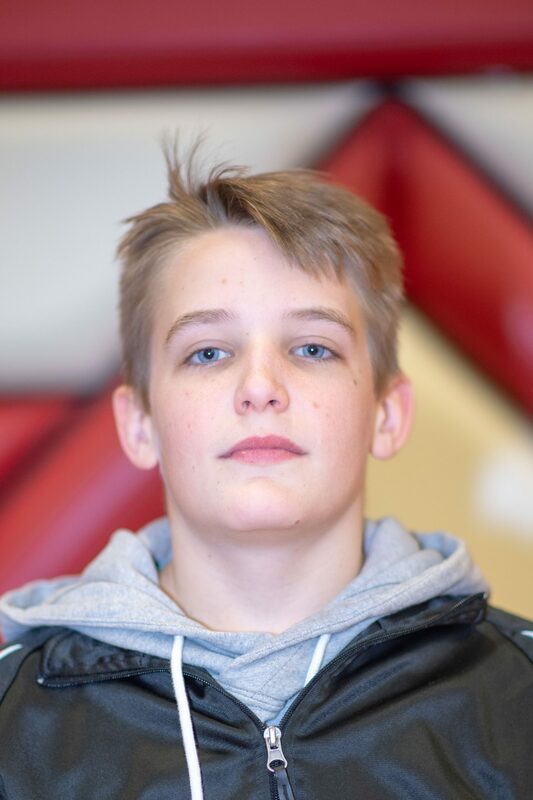 195- Michael Kustanbauter Sr., Muncy decision Dane Csencsits Jr.,7-2. 220- Cael Hembury Jr., Muncy, decision Jared Harka Sr., 4-3. 285- Nick Warnke Jr., SV, pinned, Donovan Diehl Sr., 1:49. Up Next: The Panthers advance to the PIAA quarterfinals where they will find the Burrell Buccaneers. The Bucs, ranked #5 in the state, are the District VII champs and were a 42-15 winner over the Newport Buffaloes. Today’s state championship wrestling action for the Panthers will start at noon.